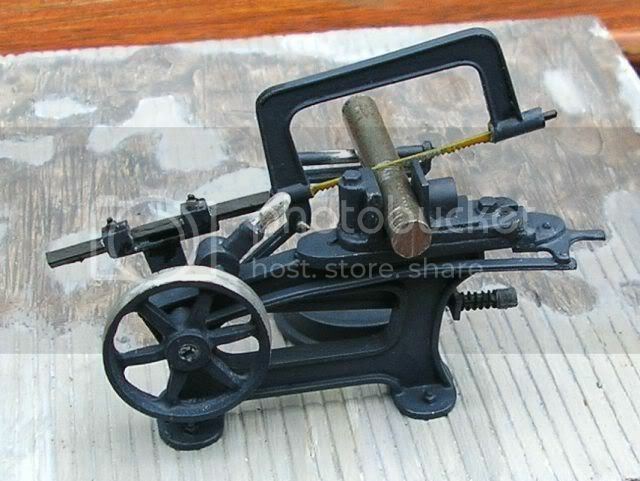 Well here's my first attempt at Western Scale Models 1:20.3 scale Machine Shop -- the Hacksaw, only a dozen pieces in this one. The floor standing lathe which is around 7" long has over 50, not sure how long that one will take to build. 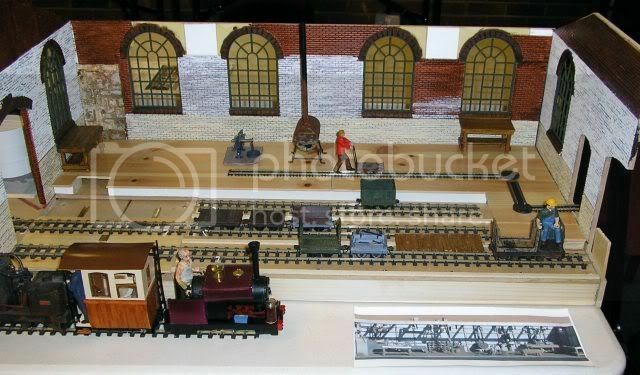 The complete Machine Shop will form a 28" backdrop to Basildon MRC's Gn15 Traverser Layout. Very nice Gerry, I'm even more envious now, one day I will justify the cost of buying one of their workshop kits. There is something about big chunky workshop equipment that is so appealing. Following your off list comments about the size of the motor to drive all this equipment and now seeing the hacksaw, I wonder if the Back2Bay6 oil engine in the attached pic might be suitable, though I doubt you want to spend out any more. Apologies that the photo is not of a completed kit, I just took this one out of its box and placed it together. Looks great Steve, and with the space available (layout is now 14" wide), I think we could ditch the electric motor in roof space and install oil engine on floor with drive up to the cross shaft power system. In view of the abysmal temperatures in the UK at the moment I've built the shop heater; even then "Bruno" has still got his gloves on. As he needs a box to stand on to use the bench I'll have to find some larger scale figures, the 1:24 to 20.3 jump is too much. The heater is a substantial piece of hardware, weighing in at 160 grams without stand or any gismos installed. The fire door does open. The bench is made directly from the set of plans that come with the kit so the next one I make will be a tad shorter in the leg. The bench lathe sits on a long six legged bench which I've yet to make. 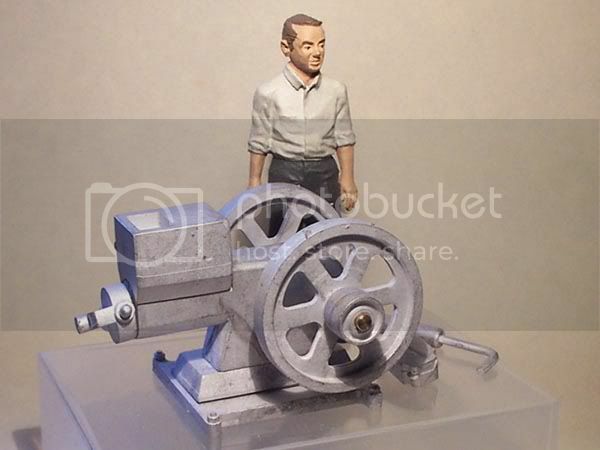 The more I look at the components supplied (in this scale) I'm convinced that it would be possible to animate the machinery though some pieces would need to be substituted for more durable materials -- NO I'm not about to try. Hundreds of good industrial photos on this site, lots of detail stuff. Gerry, nice job on the machine shop gear -- looks superb. I've looked for similar sites based on the UK without success. Be warned though ... you can spend a long time browsing these sites if you're not careful! 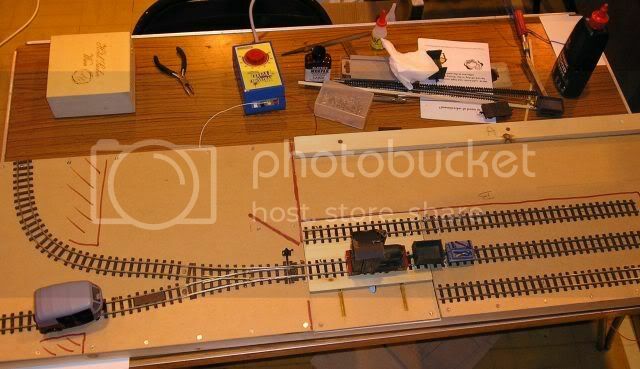 Using compass convention the workshop is N and E of the three sidings. The lower siding off E will go to a hidden cassette (later). Have placed backdrop to show the punters what we intend to build -- quite likely that this will be changed and be modelled (later). 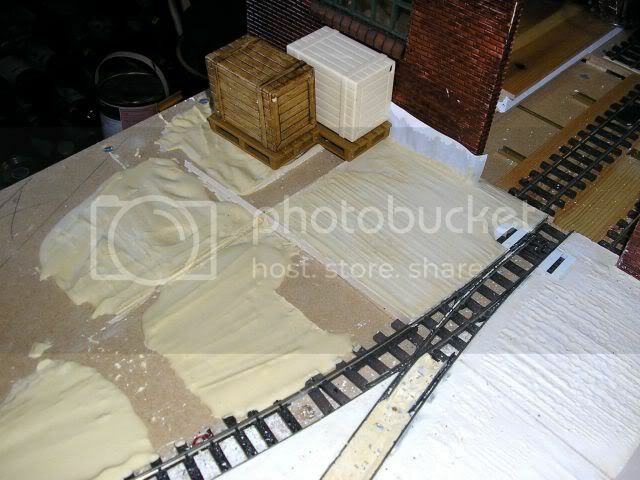 The 9mm track is non-operational and just has a couple of wagons for moving components/ swarf, what have you. It is, of course, at the higher (around 16") workshop floor level. Moving outside the building to the W, the lower track is a siding which will have facility to park engine whilst another is making the shunting moves. The northerly track which exits N through a bridge with road above (got to have somewhere to put my 1/24 pick-up truck though the Fiat 500 is a bit out of timescale) will go to another cassette (later -- where have I heard that before). Well there were to have been three of us building it BUT one has found he's double booked, being due at his son's camping weekend. We're now down to two and 1/2, the half being our solder expert who will solder what's require whilst manning a Sales Stand. The base board framing I'll build prior to the event so that we can start laying the track as soon as all the wiring has been fixed. 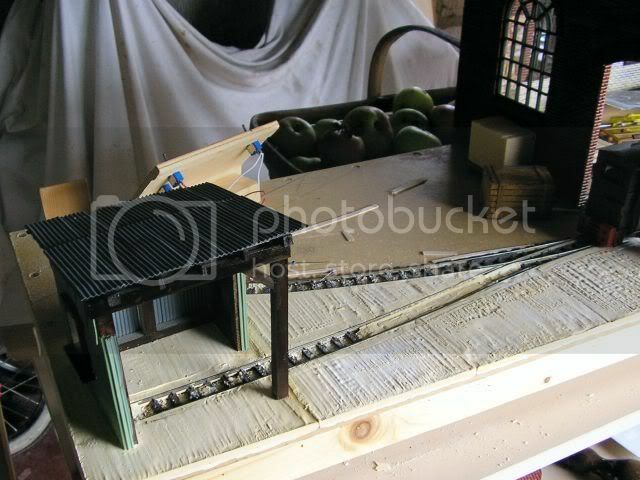 Perhaps I should buy a length of Peco HOm track but then I've got to scratch build both the turntables or loose them and the flat bed trucks. I'll think about it; the 9mm track cost zilch so no sweat if it's ditched and it certainly won't be installed on the Show weekend as the complete Machine Shop needs finishing before finalising the track location. As the build is in a Public Place I thought too much MDF dust wouldn't go down too well so some of the cutting and driiling needs to be finished prior to Saturday. At top of photo can just be seen the control handle (taken from a Victorian Cabinet Lock). The slot in the traverser is to house the bracket which locates the control rod. 1. Provides clearance to enable bracket free movement. 2. Give fore and aft STOP positions (may review this on site). 3. Enables the whole thing to be screwed together as the handle is soldered to the control rod. The brass runners shown will be fitted at the show with the small screws locating each channel onto the base. The square section brass tube will be CA'd to the Traverser. 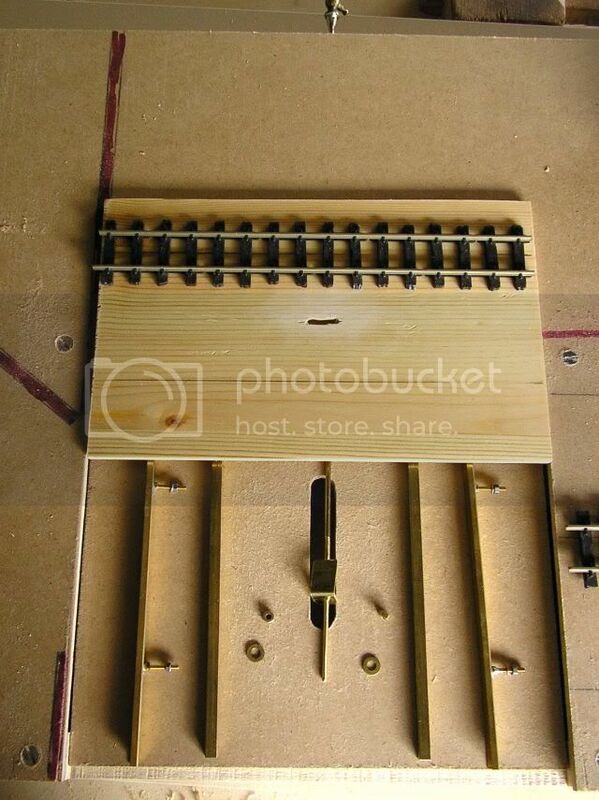 Hopefully the sliding brass runners will adequately transfer current to the rails. I'll be shocked if it doesn't! Well here's Marvyn (his singing is abysmal) pushing his trolley. Not sure what to do about the head, I've two hats (Baseball or Stetson) neither of which seems appropriate. His right hand needs some more surgery -- looks as though he's wearing a glove at the moment. Hi All, as promised here's a photo of the completed board with track fixed and wired (except for dead section switching). 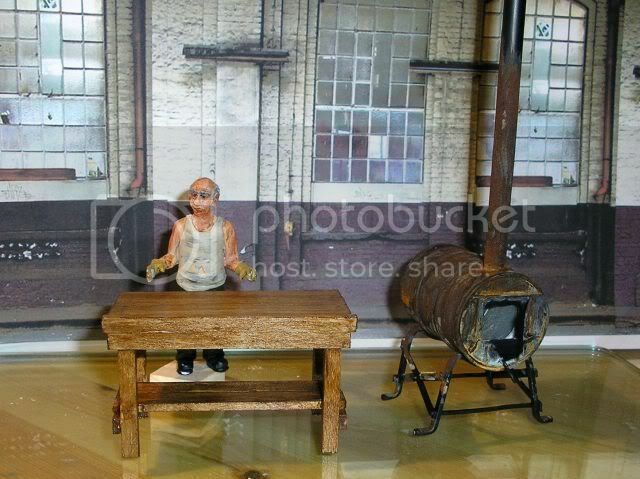 Am now waiting for some large (resin cast) Industrial Windows -- yes I've ditched the photographic backdrop. 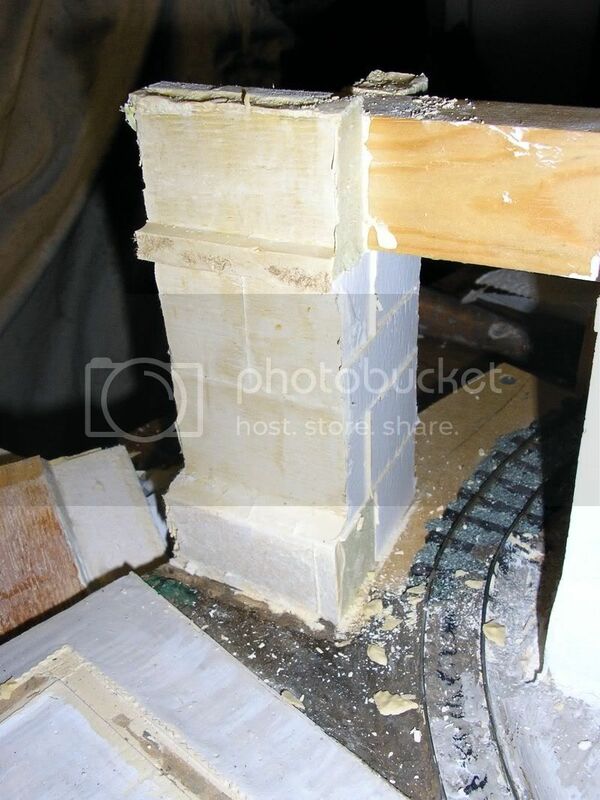 To add a bit of interest, one corner of the machine shop will have a section of Roman Wall built in. Hopefully the Machine shop walls will be up and clad by the time the esseXChailey comes around in a couple of weeks. Problems, no not really except for the bits that were forgotten on Day1 so tasks that could have been finished then were delayed until Sunday; then when the the whole system was checked with a loco we found that it worked beautifully up to the traverser then wanted to reverse its direction of travel. I blame the solderer, he blames me; the wires were colour coded BUT round back of board somehow they got switched. It works OK now. Public reaction was somewhat limited as tables supplied meant we had to work behind table with the Photos showing what layout would (should) look like on completion -- also had a publicity sheet based on this site's data and clearly identifying the URL. 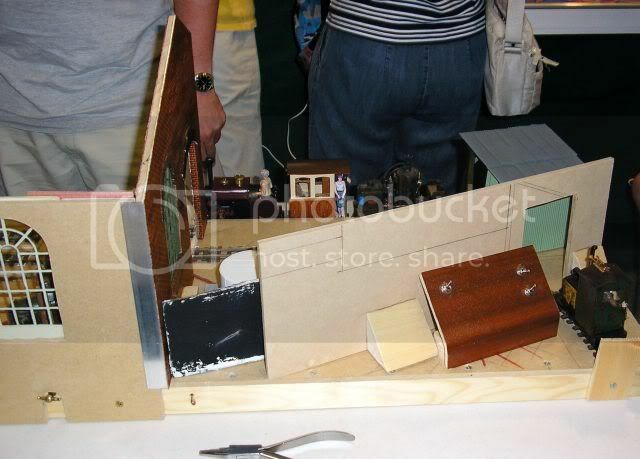 Now that payed dividends -- "Wheels" is now thinking about a Gn15 site after spending some time reading our posts and an O Gauge modeller without a layout went away with a copy of the publicity sheet. Could be TWO more Gnutters in SE shortly. Not quite as far advanced as Steve's Traverser BUT it does work and it is the first layout that I've got to that stage. Still lots to do before it's finished. I plan to plank the floor with real slate beneath each of the the machines -- was going to cover it all in slate then remembered that I'm not supposed to lift heavy weights after my March episode. The layout is still only 48" x 14.5", with 30 " being within the Factory; I've merely added 18" of outside to enhance (I hope) the operation. 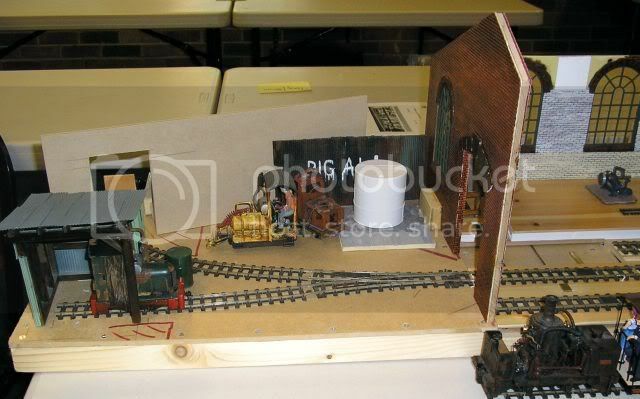 Still have to add the cassette at the end of the front siding and the fiddle area on the line into the factory. This fiddle area will increase the layout depth by around 12" making overall dimensions 48 x 26.5" -- this will give me an area behind the factory with the four large windows where I was thinking of running a Steamer (Gerules + French Carriage) on an automatic basis so that they can be seen passing the windows. Would be room behind this track to locate a couple of my smaller Bonsai so that these too would be visible through windows and above roof line. Time will tell. Here's the Machine Shop as shown on Saturday. Backstage the controls -- only three switches needed to control dead sections; enables three locos to be present although (when finished) only two will be visible at any one time. The brass (Victorian) handle operates the Traverser and the brass loop the single Y point. 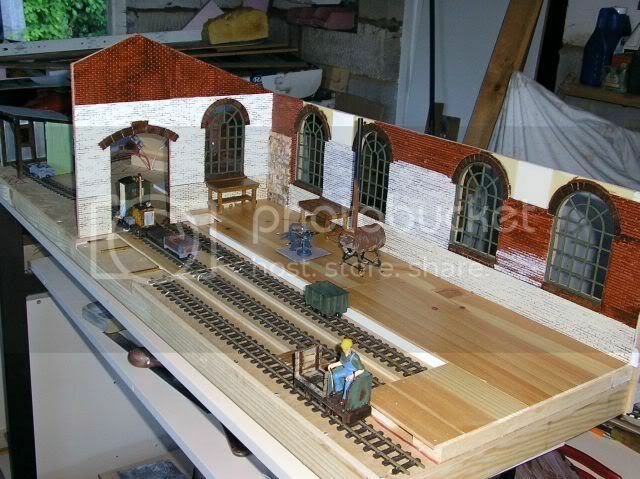 The small corrugated shed is the Loco Service area -- just room inside to fit a small bench (not yet made). Close-up of the dental plaster concrete, the ridges are probably a little too pronounced -- difficult to do as has to be done in the 30 seconds or so between workable and solid; too late and it picks-up and tears up surface. They're coming back during the week to finish the job. The concrete looks very good Gerry, no bad thing having the ridges a little too pronounced, that will draw the attention too them, whereas if truly to scale, might not be noticed. Like the little workshop building, has really come together well. This is just the type of structure that would be ideal for someone trying an architectural model in this scale for the first time. Did you use aluminium foil or paper for the corrugated sheets? I know it makes no difference once painted, just curious. 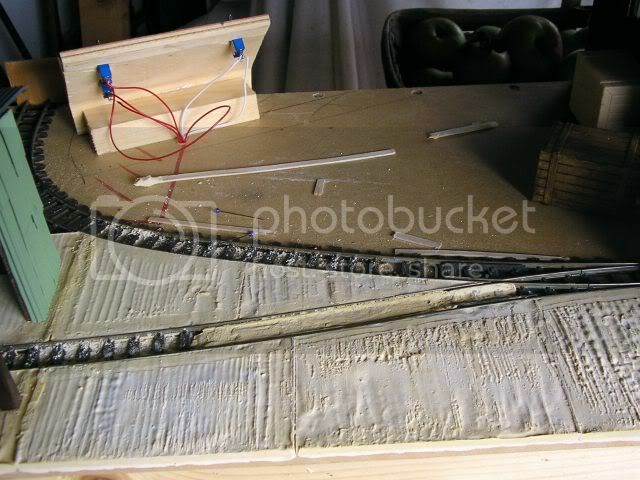 The dross on track is merely the odd bits cleaned off the top of the mould. Shuttering was sealed this time with Silicone sealant which stopped any leaks and is easy to peel off afterwards. 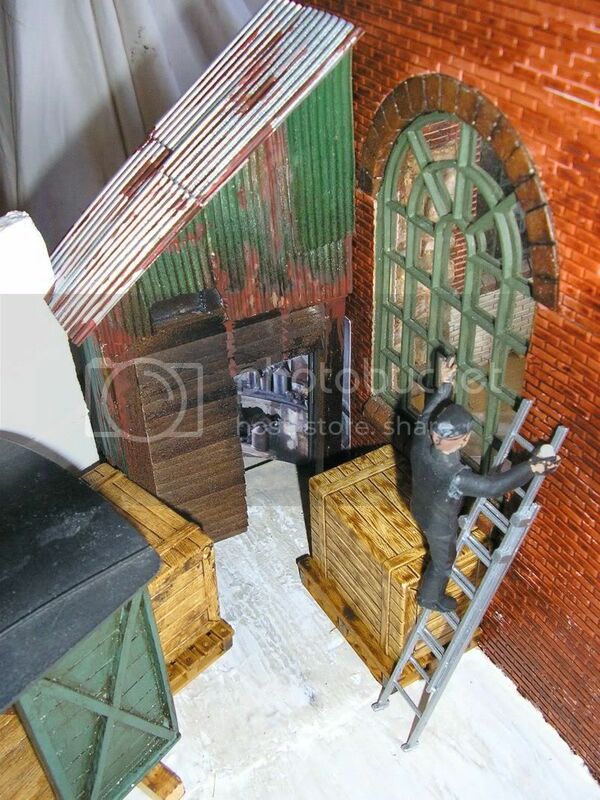 Here's tuther end with a "Flat" outbuilding and Bob's figure now fixing the window. Still need to carve a tad more off his head before adding hair features. You'll note that the interior photo isn't correctly located but nothing's fixed as yet. It's a KLR interior which has been horizontally flipped to get correct perspective.